I'm sure that it is not uncommon for children to find themselves involved with many of the same charitable organizations in which their parents were involved. In that vein, I have followed my mother's lead by making JARC one of my favorite local causes. 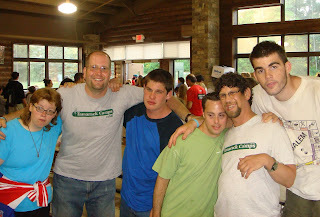 JARC enables people with developmental disabilities to live rich, meaningful lives as respected members of the community in settings of their choice; to access a Jewish way of life; to provide support to families; and to educate and sensitize the public about people with disabilities and their value to society. For the past forty years, JARC has been successful in fulfilling this mission. As a toddler, I grew up in a home that was walking distance from the grocery store. I have fond memories of walking to the Farmer Jack supermarket where the kind gentleman who bagged our groceries was likely the first person with developmental disabilities that I encountered. I recall being curious about him and inquiring to my mother about his condition. Returning to that same grocery store as a teenager and watching him collect the stray carts from the parking lot, I recognized what a hard worker he was. I recall thinking how wonderful it was that he was so dedicated to his job. Everyone knew him. He was a valued member of the community. It is certainly natural when seeing a person with developmental disabilities to whisper to oneself "There but for the grace of God go I." One thinks, It could just as easily be my child with that condition. Yet that is not the reason I have become involved with JARC. Rather, I believe we owe it to these men and women, as well as to their families. They deserve to live in a nice home, to have jobs, to be creative, to be involved in the community. JARC makes that a reality for them. JARC began forty years ago by a group of Jewish parents concerned about the future of their children with developmental disabilities. Today, JARC is one of the nation’s largest providers of community-based Jewish residential services, serving nearly 150 adults in its group homes and various supported living arrangements. Tonight, hundreds of JARC supporters will come together for the annual fundraiser at the Fisher Theater in Detroit. It's become a yearly routine. The young adults will gather for dinner at a pre-glow event that demonstrates that the future of JARC's communal support is secure. We'll then take our seats for a moving, tear-jerking video about the important work that JARC does. We'll then enjoy the Broadway musical "Legally Blonde." JARC is a "feel good" organization. It makes people feel good to know that JARC helps the men and women it serves live better lives. I have seen this first-hand. A few weeks ago on the Sukkot holiday, several dozen people served by JARC came to our home for a sukkah party. 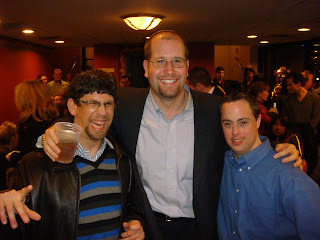 It was a wonderful experience and very important for my children to be exposed to people with developmental disabilities. It is my hope that my own children will eventually follow in my footsteps and support JARC as an active volunteer. Last week, JARC dedicated another home in the community. But this home is different. It is the first energy-efficient, barrier-free group home in the United States. As I stood at the dedication ceremony, all I could think was "Wow!" The 3,200-square-foot ranch is being used as a group home by JARC, a Farmington Hills-based nonprofit that helps adults with developmental disabilities. Six women, ages 30 to 70, moved into the home on Minglewood last month, said Richard Loewenstein, chief executive officer of JARC. The home has geothermal heat and bamboo flooring and uses recycled building materials and native plants for landscaping. As two of the home's residents are disabled, the home has features like wide doors and low sinks to accommodate wheelchairs. It has four bedrooms and 3 1/2 baths. It is great to see how this important organization has grown over its first forty years. But it is even better to see how it continues to push forward for the sake of the wonderful community of men and women that it serves. Miracles happen at JARC homes and programs, and also in the hearts and minds of those who work to support JARC. It is so true that when you include someone with a disability, you enrich a life--yours! That enrichment cannot be explained, but must be experienced. It does, however, have to do with holiness (and with true humanity).